Today I’ll show you how to go about separating onions and maximizing the value of your store-bought seedlings! 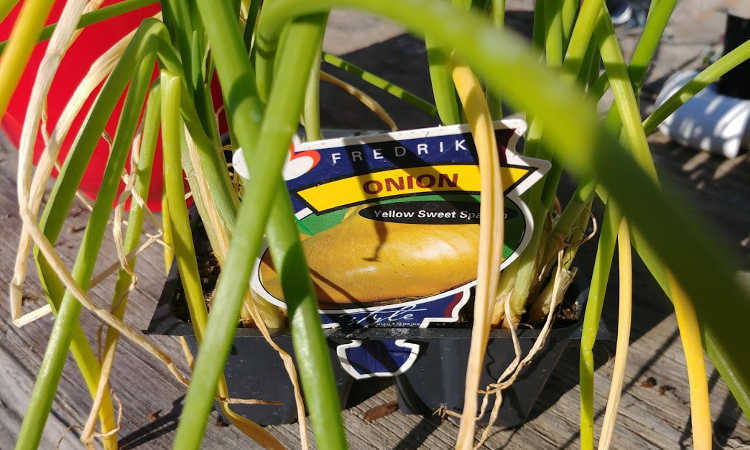 When you go to purchase onions, leeks, or other alliums at a nursery or garden center, they often come in a six-pack container that’s just crowded. Even if you started your seed at home, this can become an issue. It’s essential to separate them to promote development. 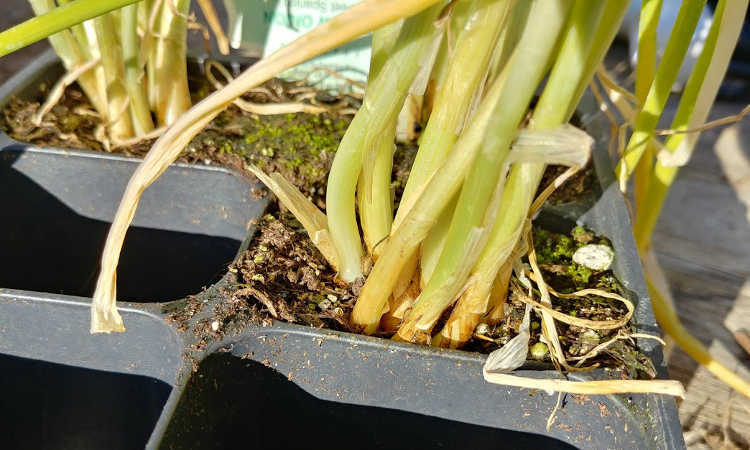 Large onions simply won’t form if you have a clump of plants jammed into one space! More often than not, onion starters are overplanted. This is mostly because onion seeds are extremely tiny. In nursery starts, it can also be deliberate as they know that at least one in each compartment will survive, albeit at the expense of the rest. A nursery pack of onion seedlings. These are yellow sweet Spanish onions. 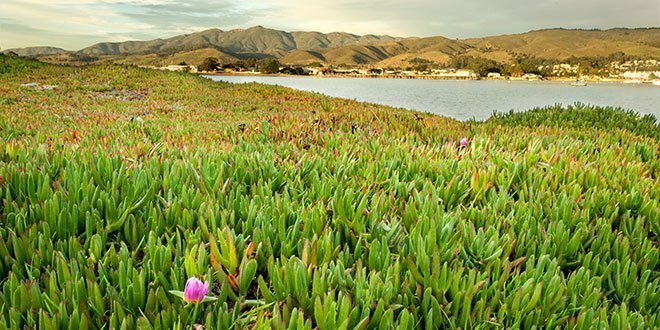 With a little patience, you can manage to get all of them to survive and thrive. This makes those six-pack containers of onions one of the best seedling deals you can buy! So let me walk you through how to separate onions from their confinement. Look for a healthy six-pack of onions, with as many green shoots as possible. 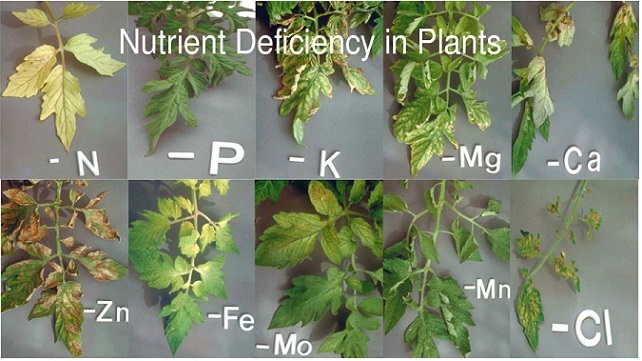 Try to avoid those which have gone mostly yellow, as they’re starting to become nutrient-deficient. If possible, pick a package that has plants less than 6″ in height, as those are much easier to separate, but don’t worry if all you can find is taller seedlings. You can still get an abundant harvest from those too. A closeup of the nursery pot. There’s eight onions jammed into one section. You’ll notice the outer leaves are starting to yellow, a sign that they need transplanting. You have your onions – now, the next step is to figure out how bad this process is going to be. Start by gently removing a segment of your onions from their nursery pot. If the new onions are short, chances are that you’ll see more soil than roots, and that will make separating them significantly easier. 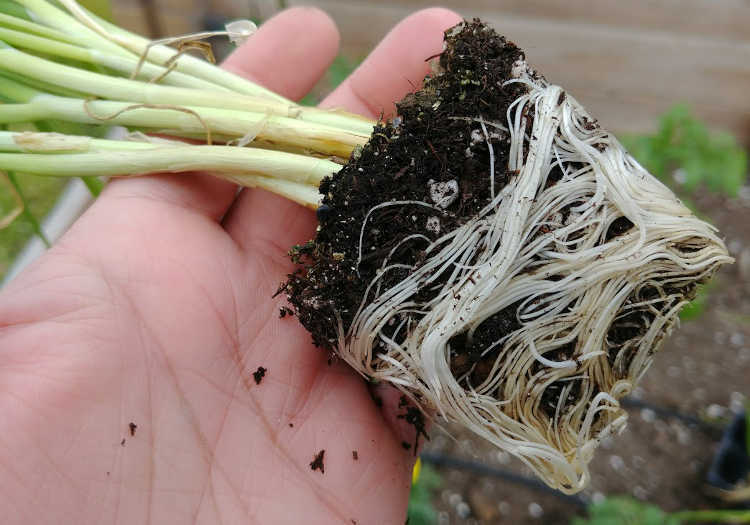 Seedling onions over 10″ in height are likely going to look more like the picture below: 6-10 small onions with a tangle of incomprehensible roots. 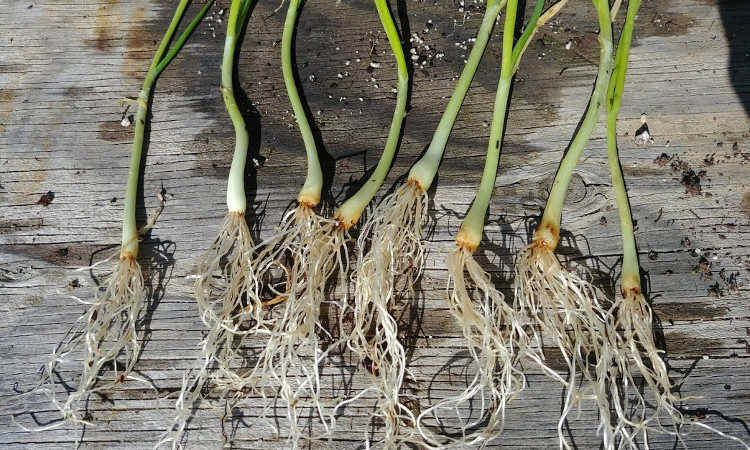 Severely tangled and rootbound onion seedlings. There’s no visual indication of where the onion roots might start, or to which plant they belong. All you can see is a tangle of roots with no apparent end in a squared-off clump. You’ll need to clear away as much potting mix as possible to get a glimpse of the base of the seedlings. 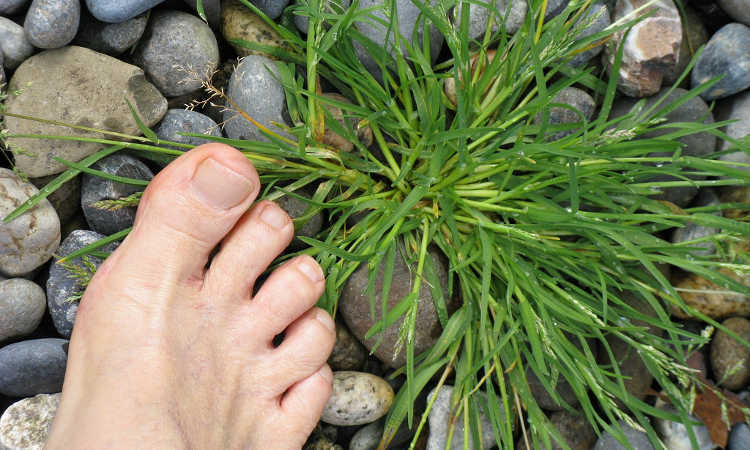 Use your fingertips to gently brush off as much excess soil as possible without damaging the tender root mass. 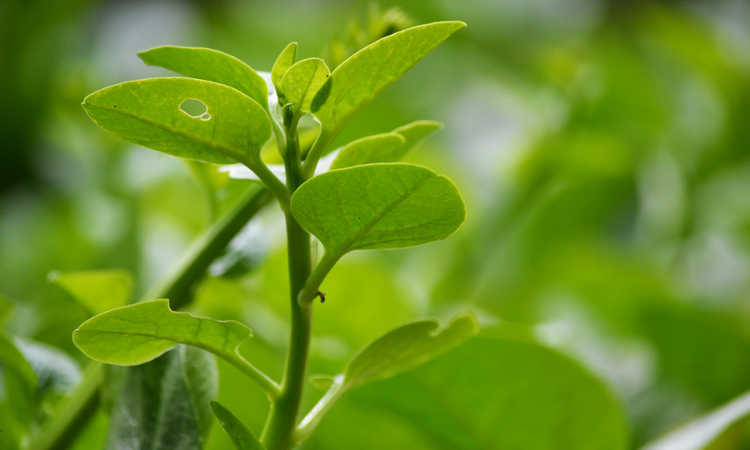 Be gentle, as the plants have already been competing for nutrition and don’t need any extra damage to contend with. Once you’ve removed excess soil, your onion seedlings should look a bit more like this. Try to expose the very base of the onion seedlings themselves, but if you can’t get it all off, don’t worry. At this point, it’s time to let your onions have a soak to rehydrate. Water provides two things to this process. 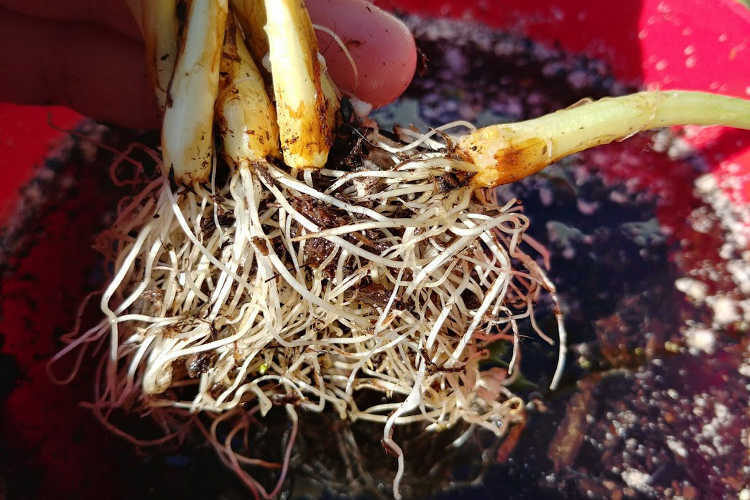 After a soak, the individual roots will slightly thicken and become more pliable, which makes it easier to separate them. In addition, the water acts like a lubricant to help the roots slide across one another. Put those onions in the water and give them a break, they’ve earned it! Give your onions a good, long soak. I like my onions to rest in the water for at least 45 minutes to an hour. During this time, you can go prepare the bed where you’re going to be planting your onions. Onions like a lot of nitrogen in their soil, so adding nitrogen-rich material that won’t burn those tender roots is a great idea. 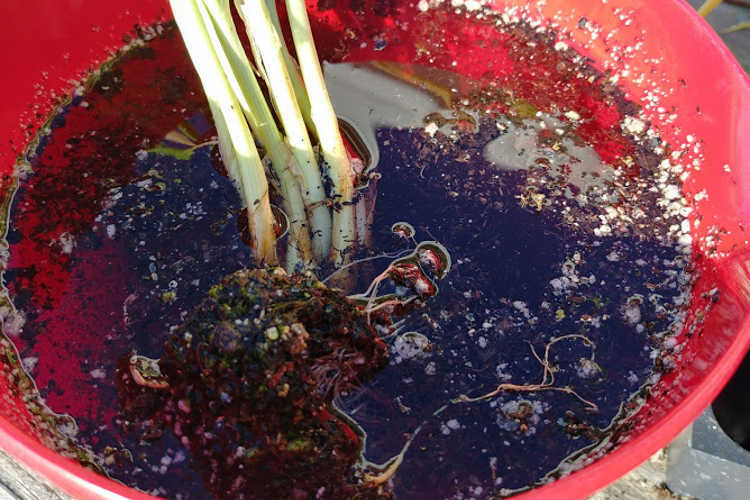 Make sure your soil is loose and aerated, as the onions will need to push the soil around while forming their bulbs. Well-draining soil is also a must. After your onions have soaked for a while, it’s time to come back and take a look. Chances are that they’ll have started to slowly unwind themselves from the pot shape, but they’re still going to be tangled up quite a bit. 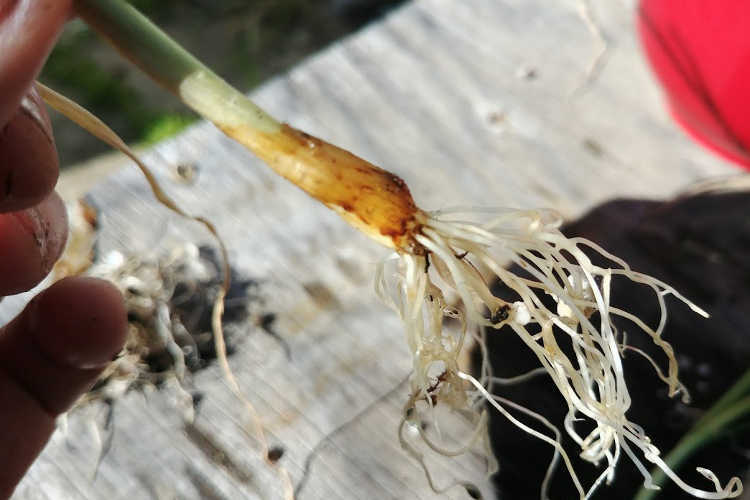 Your onion roots should be starting to loosen up. At this point, I use my fingertips to gently separate the root entanglement a bit more. Think of it as if you were combing your fingers through your hair. You don’t want to pull on the roots to break them, but you just want them to separate. You’ll still be able to see soil amidst the center of the root ball. Removing as much of the soil as possible will make separating onions much easier. 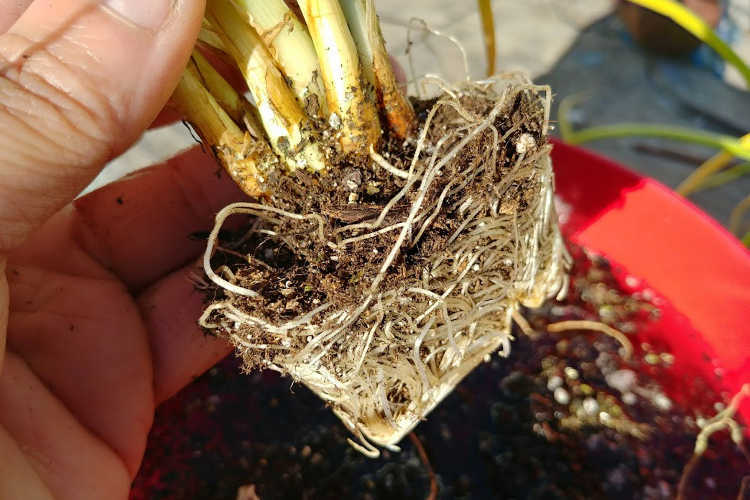 Alternate between swishing the root mass in the water and using your fingertips to separate them as much as possible without damaging or breaking the roots. Now it’s time to figure out where to start separating onions. As soon as most of the soil is out of the root mass, it’s time to examine the clump. Some of the onions along the outside should look easier to separate than others. Pick the one which looks the easiest, and very gently bend the shaft of the onion to one side. Does it seem like you should be able to extricate it? If so, start with that onion. If not, go back to examining the root mass and trying to find the easiest one to separate first. Starting to separate the onions. Gently grasp the base of the onion stalk, just above the root mass, and very lightly pull on it. You should be able to wiggle it a little further out from the rest of the roots. If it seems to get entangled again, dip the root mass into the water and swish it around. This makes the roots more slippery once again and helps you to separate. This first onion is usually the trickiest to separate. But your patience will, in the end, be rewarded. The first onion has been separated, and has long and healthy roots! 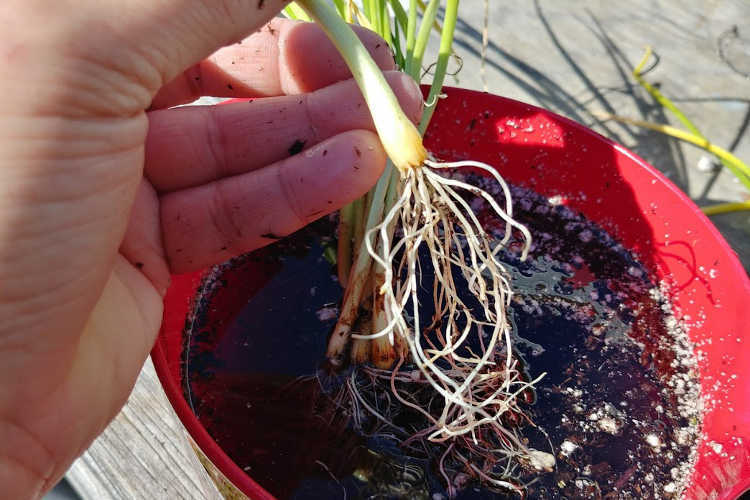 Now that you have one free, re-wet the root mass for the rest, and leave your separated onion in the water. This keeps it hydrated and happy until you’re ready to plant. Repeat this process again, finding the next outside onion that looks like it can be removed. If there’s serious resistance, switch to a different one and try again, or swish the roots through the water again to keep them wet. 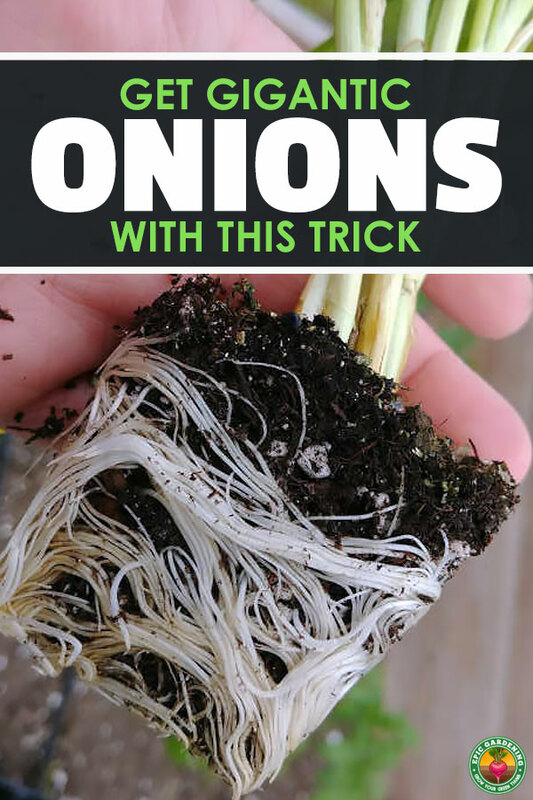 The more onions that you remove from the root mass, the easier the process will become. The last few practically will come apart on their own. 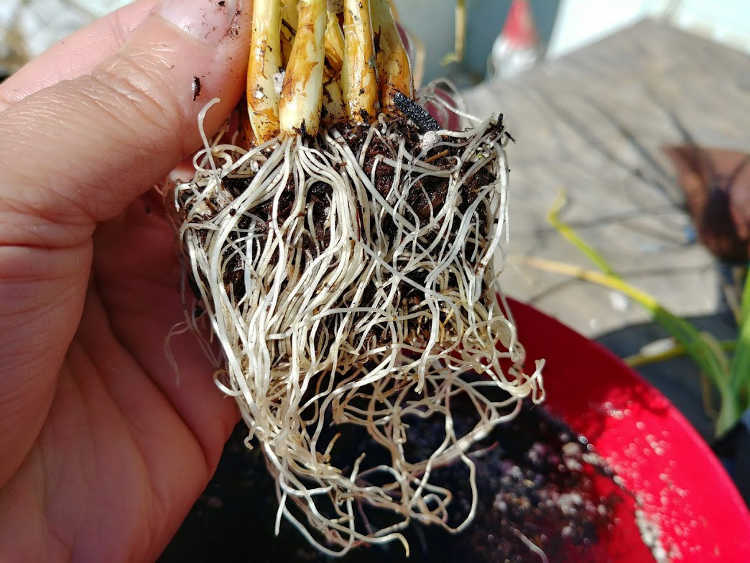 The last onion looks like it has a lot of roots. That very last onion will be still clinging onto whatever roots did break off in the process of separation. You will need to lightly comb the roots with your fingertips to remove whatever loose bits are present. Don’t exert any real force, just slide your fingers downward. Whatever bits broke off will end up in your hand at the end, along with likely some stray bits of dirt, perlite, and other potting mix. The few roots that broke off in the process. Usually, these roots that snap free are the weaker ones, or the ones most entangled with the growing medium. It won’t harm your onions to lose these, and they can go straight into the compost pile. There’s one more step to preparing your onions for planting at this point. You’ll want to examine your onions closely to see what they look like. Take a good, careful look at your onion seedling. Onions form in layers. 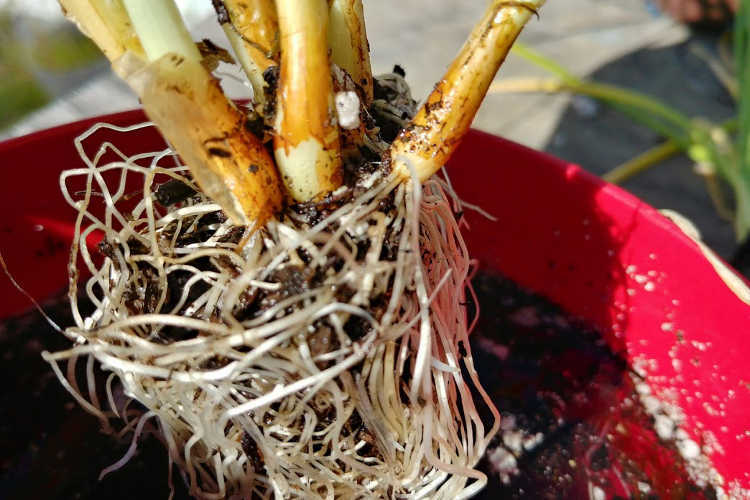 However, planting an onion that has an outer layer that feels slimy is just asking for rot to form on your seedling plant. Remove any slimy exterior layers like the brown part shown in the picture above. You want the exterior to feel fresh and clean. This is also a great time to trim off any yellowed stalks. Be sure to leave at least one healthy green stalk on the onion to give it something to soak in the sun’s rays with! 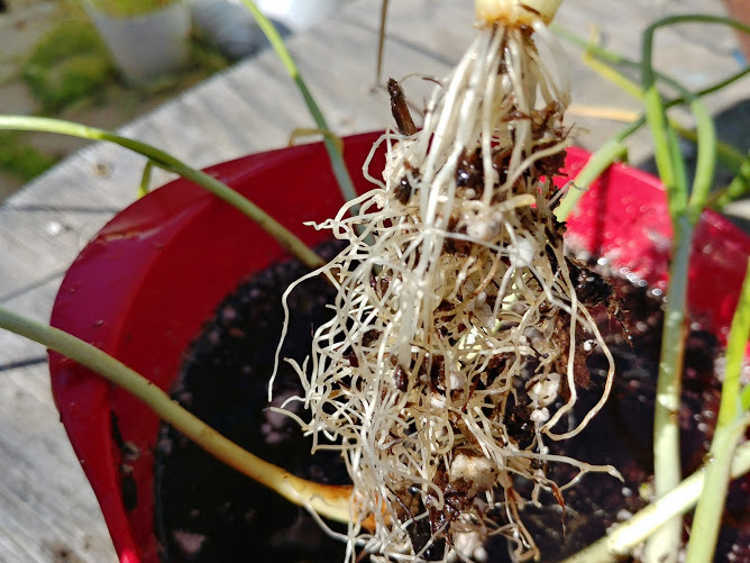 Look at all of those healthy onion roots! 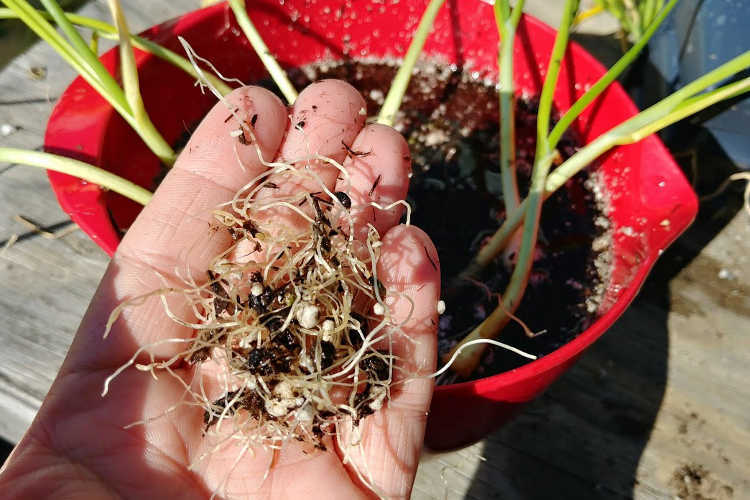 At the end, instead of planting one clump of terribly root-bound onions, you now have multiple healthy and happy starts to go put in the ground. Space your separated onions 5 inches apart to form big, healthy bulbs, or about 2 inches apart if you just want to grow green onions. Don’t waste the water you used for separation. Use it to water in your plants! The residual potting soil will stay with the plants that way, and you don’t need to go fill up a watering can or find the hose. As you can see, separating onions is a really good value. Out of that one section, I ended up with eight healthy plants. So far out of this six-pack, I’ve gotten 36 plants and I still have two more sections to separate! I expect well over 50 onions to be planted by the time I’m done. This process works really well on virtually anything in the allium family. I do this for my leeks as well, and it gets me tons of produce every year. See? Separating onions is easy and gets you a much bigger harvest! What’s your favorite variety of onion? Do you grow mostly green onions, or do you like to have big bulbs? Tell me all your onion stories in the comments! Does this apply to green bunching onions or spring onions in a six pack? It’ll work for either, Ed! An excellent information piece I have never known how to plant these “sets”, and have never had any luck with them. I now know what I have been doing wrong, and THANK YOU so much for the very detailed and easy to understand article. It is time to plant these now in Australia, (sub tropic), so am eager to have a go tomorrow. It’s not necessarily WRONG to plant them as is, this is just one of our ways of getting some extra yield out of those 6 packs! 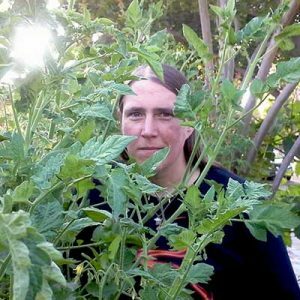 Happy growing, Leslie! Without understanding this, I did not separate my onions before planting. They are growing well, albeit cluttered for space and have now been in the bed for about a month. Is it still possible to separate them? Thank you so much for this tutorial! It really was one of the most useful ones I’ve seen!!! I have always typically grown green bunching type onions or shallots. I also have a rather large plot of walking onions. This year I started some Alisa Craig type from seed and ordered an f1 type Candy to try. Your post is coming in very helpful as I try to get the mass of roots separated for planting!